The workers at New York City’s Tom Cat Bakery are asking consumers to show their support at the dining table. Every week, the workers at Tom Cat bakery in Queens proudly serve their city their freshly baked loaves, but they’re asking people across the city for once to give up their daily bread this Friday. Instead, they want fellow New Yorkers to stand in solidarity with them and feed the resistance, because Homeland Security is getting ready to raid their kitchen. Since March, the workers have baked under a cloud of fear. The management has told them to present proper employment papers by April 21 or be fired. Coming amid President Trump’s anti-immigrant crackdown, workers are fighting for their jobs and the lives they’ve made in this country. With or without legal status, workers have a better way of proving their right to stay. The management initially eased up on the identification checks, allowing an extension from the original deadline to prepare their legal cases and brace for possible layoffs. But workers have nevertheless continued their campaign with the planned mass bread-fast protest to defend the targeted workers tomorrow. And beyond their immediate plight, Tom Cat’s workers are a canary in Trump’s coal mine as ICE intensifies its deportation drive, with a sharp rise in arrests of immigrants without criminal records reported in the New York region. Meanwhile, Attorney General Jeff Sessions has threatened to cut off federal funding for cities that refuse to cooperate with federal immigration authorities. As local governments buck pressure from Homeland Security, the stand-off unfolds more subtly in local workplaces, which will be a frontline for testing employers’ willingness to resist Trump and face the political and legal risks. 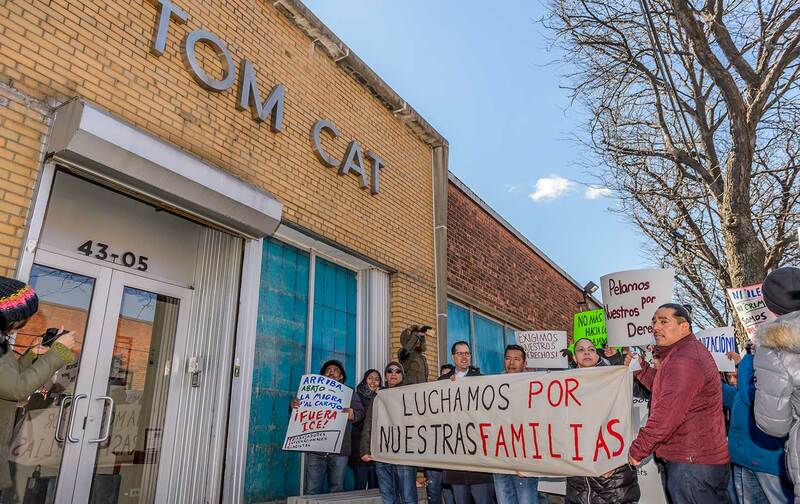 The Tom Cat workers have previously clashed with management during protests over wages and labor conditions, but the ICE warning stunned them. “I don’t feel the way I feel at work before,” said Hector, who has worked in the bakery for over a decade and helped organize the staff’s workplace-justice campaigns. Speaking at a rally at Trump Tower, he added that, with ICE’s deadline closing in, “I don’t know what’s going to happen because we don’t have enough time to prove that we can work in this country.” The company never tried to verify his employment status before, he said, even though he’s been on payroll, and paying taxes for years, while supporting two children and sending remittances to his mother in Mexico City. Although the management might never have paid much attention to immigration rules before, the gourmet bakery, which was taken over by a private-equity firm several years ago, is no stranger to labor troubles. Tom Cat’s first major labor conflict began around 2011 with a campaign by bakery drivers accusing the company of exploitative scheduling and pay schemes. With the support of the worker center Brandworkers, they developed a “Declaration of Dignity” to demand fair working conditions and equitable pay. After initially meeting with resistance, the workers secured a labor-rights agreement in 2012. The victory marked a milestone for grassroots organizing in the city’s food-production chain. While they’re not formal unions, worker centers like Brandworkers and Domestic Workers United have become a pillar of the city’s labor landscape, particularly in the largely nonunionized food sector, where even smaller boutique producers often run on deeply exploitative, bullying labor practices. It’s unclear why ICE seems to be scrutinizing Tom Cat in particular, raising suspicions among some movement veterans, that ICE is pursuing a symbolic attack on a well-known group of local immigrant labor activists. Tom Cat Vice President James Rath told the Village Voice the investigation was a “standard” audit and they were simply complying with authorities as needed. But workers want their boss to support their veteran staff, not turn them in. So-called employer sanctions, or regulations penalizing employers for hiring undocumented workers, have long been used by the federal government as an indirect way of punishing companies that hire undocumented workers. But penalizing the mere hiring of unauthorized worker tends to leave them even more vulnerable to actual labor violations, as the workers face the constant threat of deportation if they challenge labor abuses. But in an immigrant-heavy city like New York, workers are faced with the choice between laying low, or showing solidarity in public and seeking safety in numbers. Many are now choosing the latter, stepping up and speaking out on behalf of their communities while they still can. As immigrants across the country prepare for the mass strikes and protests scheduled to occur this May Day, many unions and city governments are affirming immigrants rights by declaring themselves “sanctuary cities,” ensuring noncompliance with federal enforcement efforts, and pressure is mounting on employers work to protect, rather than expose, workers at risk of deportation. While public institutions might be more willing to take political action to protect immigrants, for private businesses, the question of complicity with ICE touches on deep issues surrounding the sense of labor equity that local immigrants have developed as the foundation of the city’s low-wage labor force. Now that Trump seems bent on vastly expanding deportations, city businesses will have to decide where their loyalties lie if their workers are suffering the legal consequences of an unjust economic structure. When they launched their first workplace-justice campaign years ago, Tom Cat workers never anticipated the risks they’d face under the future president. But now Trump’s crackdown only affirms their belief that the most precious reward for their labor isn’t a paycheck, but a voice in their workplace. Their jobs might be threatened, but after so many years organizing for a fairer workplace, these workers have come too far to surrender what they’ve built without a fight.